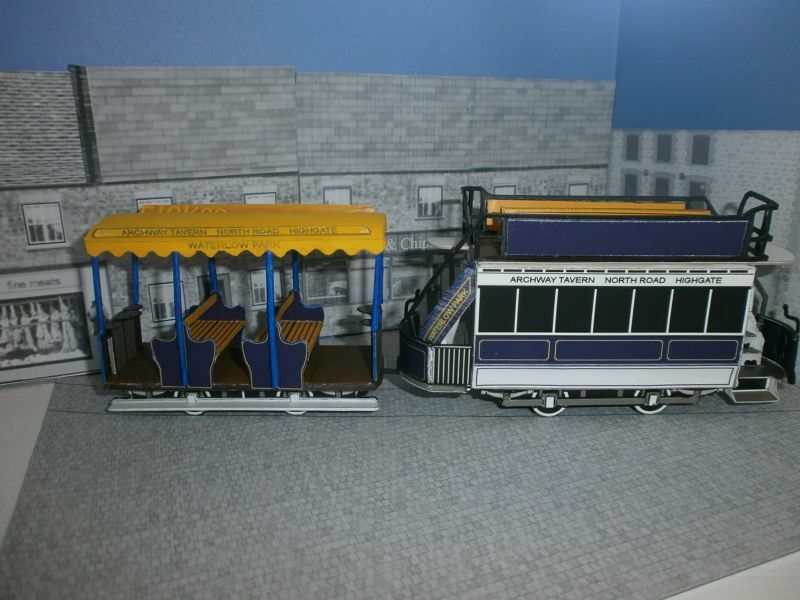 Recently completed a few Card Trams, Highgate Gripper Car and trailer and 2 Chester trams, a demi car and a D/D open top. 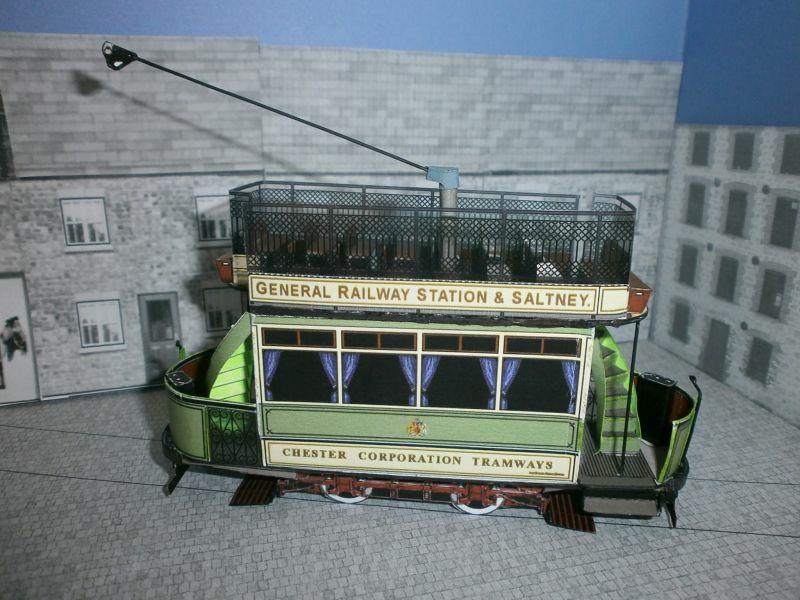 All kits are Pete Watson kits from TLRS, go to tramwayinfo.com for details of how to buy, they have a nice selection of trams and trolley buses.The above models were built a little bigger than the format they are supplied in about 40% bigger bringing them to about 1:43 scale. From the photos Owen, you wouldn't know they were card. Good job. Nice looking models Owen. I understand card trams can be difficult to build because of all the odd curves ..........you've made a good job of those. Hi Sol and Petermac, thanks for the interest shown in the trams, there are days when they go together and days when they don't........Petermac, waiting to see the layout, have you published any pics, I have not visited the site for a while so I may have missed it if you have, like the idea of the trams incorporated in the train layout. Hi campaman, that should look great, petermac is doing the same on his layout.I would love to go to Critch and see the trams there, maybe ride a few, to the best of my memory I only ever traveled on a tram once in the Eastern suburbs of Johannes burg in the mid 50's, our route had diesel and later trolley buses. 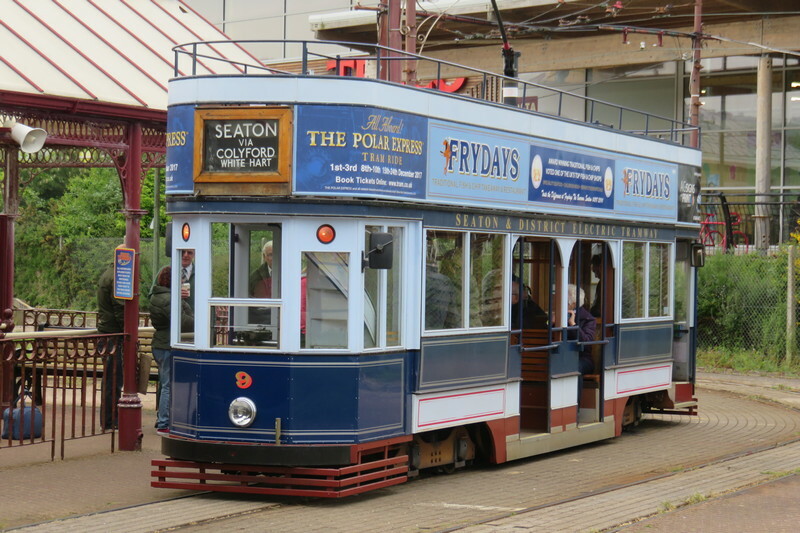 There is a Johannesburg tram No 60 in the Critch museum, a late friend of mine from the railway society Ronnie Wilson drove that tram in SA and went to Critch at some time and got permission to drive it there when it was still running. What was the motorising kit Andy ? I have a couple of Felthams to motorise in the future. I'm told Bullant motors from Oz are excellent but pricey - Halling of Austria do some cheaper ones. ...only tram picture I have, hope its of interest! It was very instructive to watch the 'Y' shaped 'turn around' overhead wires but I remember it was a freezing cold day, and SWMBO lost an earing. 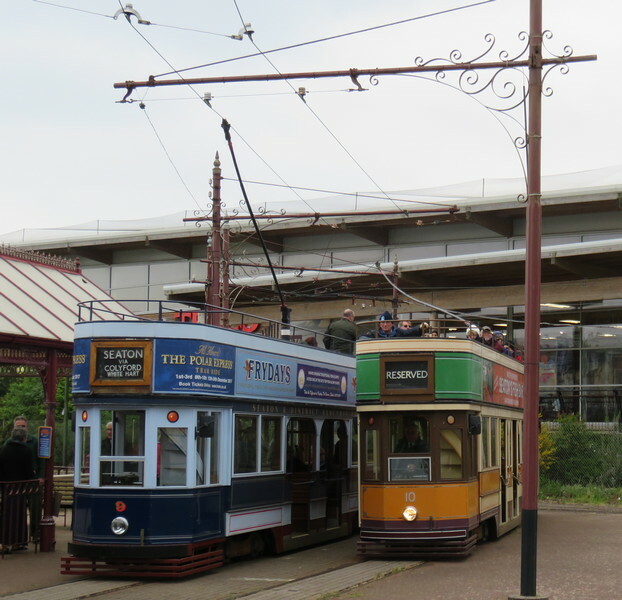 Those are some beautiful trams! Great pic Doug and yes, I agree - those pole reversers are very clever things. I remember the trams in Leeds but, to my knowledge, there was no such thing. The conductor de-wired the pole with a piece of rope (ready attached for the job) then walked towards the other end of the tram pulling the pole with him. He then re-wired it, tied the rope around a cleat and off they went in the opposite direction. Good day all, thanks to all for the interest shown and comments, zelda, I like the look of that loco under your post, please send a pic and tell us about it.Doug, yes looking at the new pic with people as a unit of scale they do look like full size trams, my reference shows Seaton as a miniature tramway, perhaps someone with more knowledge can comment. TramFan wrote: Good day all, thanks to all for the interest shown and comments, zelda, I like the look of that loco under your post, please send a pic and tell us about it.Doug, yes looking at the new pic with people as a unit of scale they do look like full size trams, my reference shows Seaton as a miniature tramway, perhaps someone with more knowledge can comment. Might have something to do with the gauge or maybe the length. It was from KW Trams, scroll down to near the bottom for the motorised bogies, it listed the required bogies in the kit I got which is packed away in the shed at the moment so can't remember exactly which one it was. Kevin, a decoder is good for both trams & trains , in fact there are decoders for accessories like turnout motors, signals & the like. Max even uses decoders in his 0 scale box cars to uncouple the box cars. Hi Ron. Thank you Yes, Max did a thread on them but too bulky to OO I am afraid. And as far as motorising points/ turnouts is concerned the of examples motors that I have seen on YouTube make too much noise for me. Or maybe the examples are inferior? After more than a year without using the Sihouette machine I thought it was about time I got it going and knocked off some more free-lance trams. I now have the large mat so can cut A3 sheets. This is the first time I have used A3 for a print and cut session and the first batch did not work. Cutter did not follow the print as it should. I reckoned it was probably software, but no idea what. However, my efforts were all with the creen on portrait for the paper, basically the same way it goes into the plotter. Well after I had switched it off over night the next session I used landscape on the screen. Lo and behold, no problems and it has cut around the printed image great. I have invested in an A3 printer as well. Old one gave up the ghost and the Canon was not much more expensive than an A4 printer. 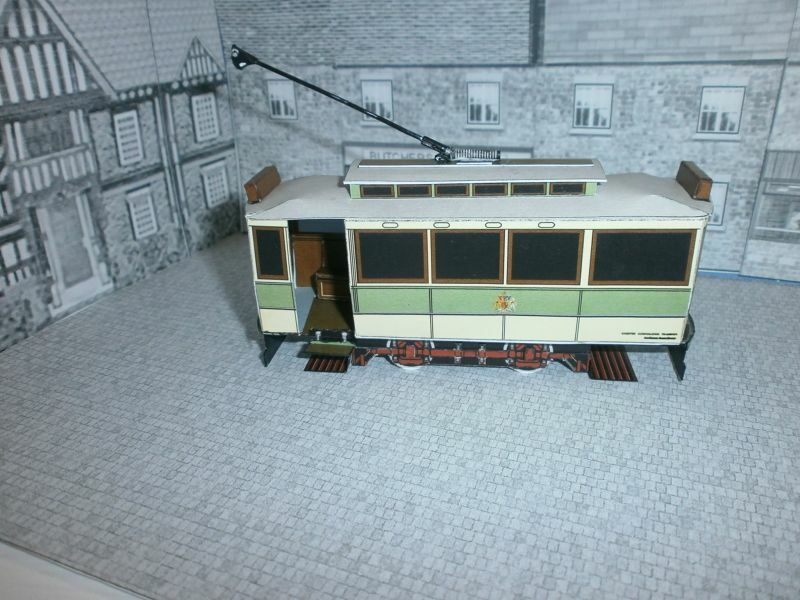 So I now have a selection of printed tram bodies to assemble and find chassis for. I have only been using 120g photo card so they will need backing with stiffer stuff. Basically I draw up the plans on CAD, DeltaCAD in my case. Save the outline as a dxf file making sure all the layers are easy to identify. I then load it into Serif DrawPlus 8. This accepts dxf files and keeps the layers. There new ancy software did not accept dxf files when I last looked. I have tried Inkscape but it is not so good with the layers. Colouring is all done by layers, basically outline and fill can be different colours. I can use two methods to get it into Sihouette Studio, the plotter softeare and controller. As an svg file it recognises the colours (but not always the text) and the line to cut around from the single file. As well as not accepting all the text it tends to inflate the file so I have to scale it down before printing and cutting. Anyhow once sorted I then print it it, including their guide marks. Transfer the print to the plotter/cutter and then cut it out. The alternative method is to save the image as a jpeg. This loads into the Sihouette software but cutting lines are not defined. In Serif 8 I seperate as one layer to have lines that can be cut. I then save this layer only as a dxf file. With the Silhouette software merging files is easy and lining up the line and the drawing is not difficult. Also they have the same dimensions as the originals. Printing and cutting is then straight forward. I would bypass the silhouette software if it loaded dxf files and retained layers as otherwise it is a drawing programme much the same as Serif 8. There is another railway forum with a Cameo Silhouette Thread. Just wondering as well if anyone else uses the cameo plotter cutter. Basically 2D CNC card cutting, much the same as the laser cutters around. In fact I believe laser heads have been tried on the Cameo but I do not think there is a commercial version, yet.